An innovative game from NetEnt, Spinata Grande slot is a must-play for party-lovers and anyone interested in enjoying a video slot that breaks away from the conventional reel setup. 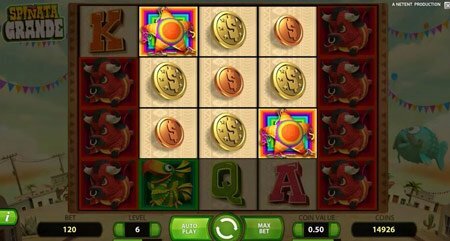 Equipped with colorful characters and upbeat fiesta music, the game also provides players with a mini slot feature, free spins, and colossal wilds that provide bigger winning chances. Net Entertainment (NetEnt) has shown, once again, with its Spinata Grande slot, why it is a leading iGaming software developer. This exciting Mexican fiesta-themed 4-row, 5-reel, 40-payline video slot is not only unique in its design, but its colossal wilds give players the chance to hit a massive win. 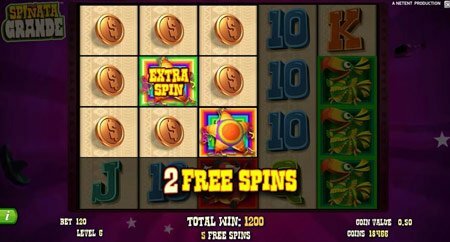 This Spinata Grande slot machine review will provide you with a first-hand look at this exhilarating new game. As soon as the Spinata Grande game starts, you will instantly be taken in by its bright colors and energy. There is absolutely nothing subtle about this slot’s theme. An animated Mexican town decorated for a fiesta, with floating balloons, serves as the game’s backdrop. The vibrant and festive reels feature a variety of different colored and shaped pinatas, including a red and yellow bull, a blue fish wearing a sombrero, a pink and purple donkey, and a green and yellow bird. When players score a win, confetti falls and the upbeat mariachi music becomes even more energetic. The reels of the Spinata Grande slot machine have a unique layout. Instead of the standard 3 rows, this 5-reel video slot has 4 and is also equipped with colossal symbols that are 2x2 and 3x3 symbols, which are notably bigger than the regular symbols. 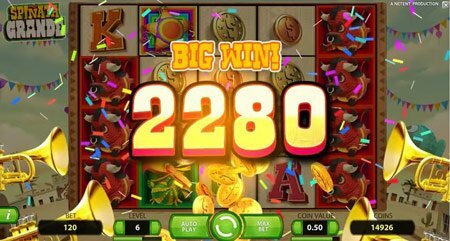 What this Spinata Grande slot review finds is one of the most impressive and exciting features of this animated slot are its colossal symbols. The reason is that when these symbols appear on the reels, especially the 3x3 symbols, your chances of bonus rewards increases. It's important to note that some players might feel that this option can hurt their playing experience by blocking good winning combinations. When the 3x3 symbols show up, this triggers the game’s mini slot feature. The pinata symbol is smashed and transforms into its own miniature slot game where you receive instant wins and can trigger free spins if you land 3 star pinatas. When activated, Spinata Grande slot bonuses can boost your winning amount, which is music to every player’s ears! The hot streak of excellent games provided by Net Entertainment continues with this game release: Great atmosphere sided by new game components and elements makes playing Spiñata Grande more then worthy for those looking for an online celebration. This game is a serious party with cool bonus features! A great game. My only complaint is that the music gets on my nerves after awhile, but that’s why they invented a mute button haha. I love this one. I like the setup and the music always puts me in a good mood. This is definitely a favorite. I can’t speak for other players, but personally I find its the colossal symbols that really make this game interesting. Is The Bodog Casino Review Top Dog?